Натисніть на фотографію і подивіться всі доступні фотографії до Apartment San Giuliano 40 with Outdoor Swimmingpool. This apartment has a kitchenware, stovetop and microwave. 4 Задасте дату а виявите наявність, зобразяться а й ціни готелів на даний час. Apartment San Giuliano 40 with Outdoor Swimmingpool is set in Rimini, an 18-minute walk from Marina Centro, 2.5 km from Rimini Stadium, and 3.2 km from Rimini Fiera. 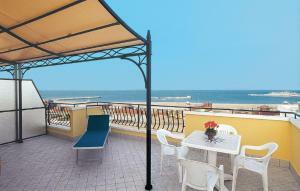 The accommodation is 6 km from the Fiabilandia. The 1-bedroom apartment is equipped with a living room with TV, and a fully equipped kitchenette. Rimini/Miramare is 6 km from Apartment San Giuliano 40 with Outdoor Swimmingpool, while Piazza Cavour is an 18-minute walk away. The nearest airport is Federico Fellini International Airport, 7 km from the property. Outdoor pool on site is shared with other guests and opening times apply as follows: June - end August Please note that the full amount of the reservation is due before arrival. NOVASOL will send a confirmation with detailed payment information. After full payment is taken, the property's details, including the address and where to collect keys, will be emailed to you.